Top summer trend = the boyfriend jean. Ann Taylor LOFT has exactly what you need. They have tall boyfriend jeans in 4 different styles and washes with inseams up to 36". Click the pics to get your boyfriend, or boyfriends, back. TALL DARK WASH RELAXED BOYFRIEND JEAN. $79.50. 35" inseam. Sizes 25 to 34. TALL BLEACHED LEAN BOYFRIEND JEAN at Anntaylorloft.com. $79.50. 35" inseam. Sizes 25 to 34. 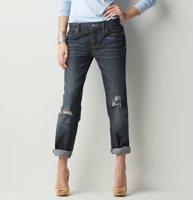 TALL PAINTER LEAN BOYFRIEND JEAN at Anntaylorloft.com. $69.99. 33.5" inseam. Sizes 25 to 33. TALL LEAN BOYFRIEND JEAN at Anntaylorloft.com. $79.50. 36" inseam. Sizes 25 to 34.